My mother made caramel apples every autumn, spearing apples with wooden sticks, dipping and twirling them into hot, bubbling caramel, and then placing them on paper-lined trays to cool and harden, which seemed to take an eternity. I loved them. Ever since, the combination of apple and caramel has been a favorite of mine. 1. Place the flour and salt in a food processor and pulse to mix. Add the fat and pulse until it becomes granular, then dump the mixture into a bowl. Add 2 tablespoons of cold water and mix with a fork. Squeeze some of the mixture between your fingertips. If it holds together, it’s fine; if not, add a little more cold water, but don’t add too much or your pastry will shrink during baking. Mix with your hands until the dough comes together, this takes a minute or two. Form the dough into a disk, wrap in plastic, and refrigerate while you tend to the apples. 2. Peel and halve the apples lengthwise. Remove the core with a melon baller and trim out the rest of the core with a knife. 3. Melt the butter in a 9-inch cast-iron skillet over medium heat. When the butter has melted, sprinkle the sugar over the top, then nestle the apples in the sugar, cut side up. They should fit snugly alongside one another. (You must pack the apples into the pan because they shrink as they cook.) The sugar and butter should bubble up around the apples. Continue to cook, without stirring, for 30 to 45 minutes, until the caramel is well colored and the apples are soft. Shake the pan from time to time to detach the apples from the bottom and to ensure the caramel cooks evenly, but do not stir. (As I am type A and like to fiddle, I carefully reverse the apples in the caramel so the half that has been sitting out of the pan is submerged.) Cook until the caramel is well colored and the apples are soft when you prod them with a spoon. 4. While the apples are cooking, roll the pastry into a circle a smidge bigger than the diameter of the frying pan. Cover and refrigerate it. 5. Crank the oven to 425°F (220°C). 6. Now you must be patient as the apples slouch into their caramely, buttery bath. When they’re ready, remove the pan from the heat and place on a baking sheet so it will be easier to maneuver in and out of the oven. Take the pastry disk from the refrigerator. Wait until the caramel stops bubbling, and then place the pastry on top, pushing down on the edges to cover the apples and tuck it inside the rim of the pan. 7. Place the pan in the oven and bake about 25 minutes, or until the pastry is nicely browned. 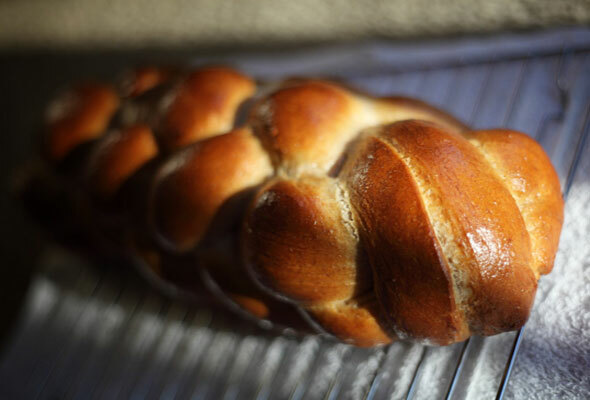 Remove the pan from the baking sheet and place it on a cooling rack. Run a knife around the edge of the pan to detach the pastry and the apples from the sides and then leave for 10 minutes (but no more than 10 minutes). To pass the time, line a flat baking sheet with parchment paper. 8. Now don’t think too much about the next step – just do it. Place the parchment-lined baking sheet, paper side down, on top of the frying pan. Flip the frying pan over onto the baking sheet and then use the pan to centre the tart on the paper. Slowly lift the frying pan off the tart. Usually all the apples drop onto the pastry, if not, you can place them and scrape any remaining caramel from the pan onto the tart. I like to scoop up the extra caramel from the parchment paper and place it back onto the tart. [Editor’s Note: We like to scoop up the extra caramel from the parchment paper and nibble it as we stand back and admire the tart.] 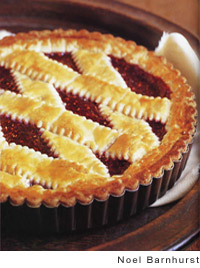 Let the tart cool to room temperature and serve with whipped cream. Tarte Tatin Recipe © 2011 Jennifer McLagan. Photo © 2011 Jennifer McLagan. All rights reserved. All recipes and photos used with permission of the publisher. 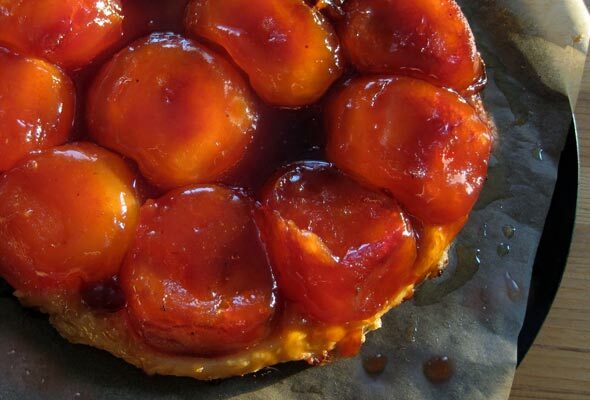 This tarte tatin cooked up perfectly, with an abundance of dark caramel over tender apples and a delicate crust. I scaled up the recipe a little bit, because my pan was a little wider than the 9 inches specified. What you want is to really have the pan crammed full of apples at the start, as they do shrink. The apples don’t have to be in an even layer; they can be wedged in. Baking time was perfect to brown the crust, and the tart was easy to release from the pan. This made a beautiful tart with a dark, shiny glaze of caramel. I had always wanted to make Tarte Tatin, so the timing was right with the apples in our garden being ready to eat! I took the easier route by using purchased puff pastry. I will absolutely make this recipe again. I followed the instructions to the letter, using a 9-inch enamel-clad cast iron pan, and it turned out perfectly! I also turned the apples over halfway through the cooking time. I couldn’t believe the softness of the caramel. Even after it cooled, it stayed nice and chewy. I served it with French vanilla ice cream, of course. Was told by my guests that I could make this again for them anytime! And I will. Tarte Tatin takes the simplest ingredients and makes a delicious and complex dessert, if made properly. It takes patience to get it right and very clear instructions for those doing it for the first time. This recipe is very user friendly, and I love that she correctly talks about what kind of apples to use — all the difference between success and failure is in this part, and sometimes specific apples are suggested that not everyone can find. I would definitely make the crust. I am not a big fan of the puff pastry crust — store bought is not usually very good, and the one in the recipe is very easy. In adding the fat to the flour, the recipe says “pulse until granular.” I wouldn’t go that far. Having little bits of butter in it are OK and make a nice, tender crust. Suggestions to cooks: In step three, after melting the butter, add the sugar and let it dissolve and get bubbly before adding the apples. Take off the heat, add the apples, and put back on the heat. I know the other way is easier, but adding the apples too early can result in them cooking too long. The butter-sugar mix will be VERY HOT, so be careful. Don’t be afraid to keep the heat on medium or a little higher. The sugar/butter will be very bubbly, and kind of scary looking if you haven’t done it before, but it will caramelize better. And again, the apples won’t turn to mush. PATIENCE is required here — it’s not done until the caramel is flowing quite slowly and lava-like around the apples. If it’s moving too quickly, it’s too runny. You will most likely have at least a couple of apple halves left after you have put the first apples in the pan. Keep them handy. As the apples in the pan cook they will shrink a bit. Very carefully fit additional apples in as they do. Your tarte will look better, and it will be very much easier to “flip” when you get to the end. As the instructions say, don’t think too much about that part, just do it! I just flip it onto a nice flat serving plate and don’t use parchment — but if it’s your first time follow her direction carefully and it will work. This tarte tatin was absolutely fabulous! It was easy enough that anyone can have great results with this dish. The caramel was just sweet enough, but is better balanced with vanilla ice cream! I used a cast iron skillet for this, which worked well and made it feel like such a rustic dessert. The only thing I would have preferred was an easier way to get the dessert out of the pan in one piece. I found that it didn’t really want to come out of the pan when I flipped it over but finally worked itself out in pieces. That kind of messed up the presentation, so be careful when removing it from the pan. My family didn’t care though. We just scooped up the pieces and enjoyed its yummy goodness. I second the advice of Lisa Owen on when to add the apples. If you cook them on the stovetop for 45 minutes and then another half hour in the oven, you end up with applesauce. I know because I’ve done it many times and been dejected. You want the apples to retain their apple texture. I usually let the butter and sugar go for 20 minutes or even longer before adding the apples and then cook the apples for maybe 15 minutes before sliding them into the oven. And this is where practice and instinct come in with this recipe. Just keep checking the COLOR of the butter-sugar mix to know when to add the apples. Once it gets nice and caramelly, dark but not too dark, then add the apples. Another thing happens if you go too early with the apples. The caramel tends to stay the tepid color of birchwood instead of getting that deep mahogany polish. Greg, thanks for your vote of confidence in Lisa’s testing and suggestions. We always appreciate comments from readers that make the cooking process clearer and more useful. DANGER! It is so easy to forget that the pan’s handle, having been in a hot oven, can cause serious harm if touched without an oven mit. And while the pan rests for 10 minutes before turning out on to a serving plate, it’s easy to forget. Also easy enough for another person who was not the cook to enter the kitchen and not know how hot that handle is. I always recommend leaving the oven mit on the pan handle as a way of letting everyone know that there is a hot surface below. Best apple varieties I have found are underripe Golden Delicious, meaning still a little green as opposed to golden. Or Fuji. They both have great flavor for this application, and they will not turn to applesauce, but will maintain their integrity. You’re awesome. This is the only food page I really love. Thanks for thinking of us always. L, val. Why, thank you very much, val. That’s lovely to say. We all certainly try hard.